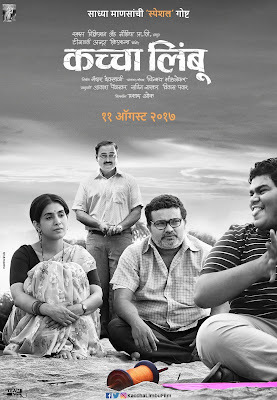 "Kachha Limbu (कच्चा लिंबू)" is an upcoming marathi movie releasing on 11th August 2017, movie stars Sonali Kulkarni, Manmeet Pem, Sachin Khedekar from this movie ace director "Ravi Jadhav" is debuting as an actor and talented actor "Prasad Oak" is debuting as director, film is begin produced by Mandar Devsthali (Director of Honar Sunn Mi Hya Gharachi) under the banner "Teamwork Ultra Creations". The highlight of the film is that it will be releasing only in black and white version. Presents : Swaroop Recreation And Media Pvt. Ltd.